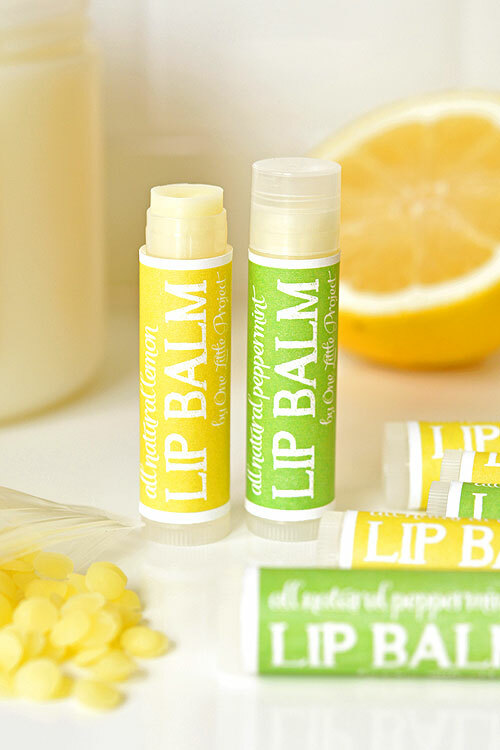 This homemade lip balm is SO EASY to make. 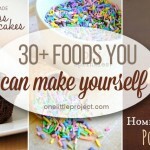 Seriously – you can make it in 5 minutes or less – no word of a lie! It has only three ingredients, all of which are completely natural. I love that I don’t have to worry about added acids and alcohol and the other chemicals that they add into store bought lip balms. Why would I want alcohol on my lips to dry them out?! Doesn’t that go against what a lip moisturizer is actually for?! Are you ready to cue the violins? I have sensitive skin. I know. Me and everyone else, right? My lips seem to have it the worst. I am allergic to pretty much 90% of the lip balms out there, and I’ve never been able to find a lipstick I can tolerate. I’ll wear lipstick on special occasions, and when I’m having my picture taken, but I wipe it off as soon as I can. On the bright side, after I wear lipstick I’m left with “naturally” red lips from the irritation for a day or two. Ha! Not exactly ideal. I’ve been pretty excited to try making my own lip balm. I was a little nervous that it would be complicated, but I managed to find the easiest recipe possible. This was my first time making homemade lip balm so I didn’t want to be messing with fancy beauty supplies that I’ve never heard of or used before. So I promise, you can be a total beginner and you’ll still be able to make this, no problem. It’s crazy simple! I’ve even included a pdf printable that you can download for the cute little labels I made, so your tubes don’t have to be naked. I’m going to give you some Amazon links to everything down below, but I got all of my supplies from a local soap making supply store because I didn’t want to wait for them to ship from an online store. Just Google “Soap making supplies in YourTown” and I bet you can find something local too. I picked them up last week, and my girls have been so excited since they saw the little baggies of empty lip balm tubes. They kept taking all of the supplies out of the bag, smelling them, turning them upside down, and neatly putting everything back into the bag. So cute. I made the lip balm yesterday and my 6 year old took two tubes (one of each flavour of course) to show off at school today and my 4 year old slept with hers. They’re both still too little to play with make up (or maybe it’s just me who doesn’t let them, even though they’d love to…) so I think this is a way for them to feel like they’re pampering themselves like a grown up, but in a safe and chemical free way. 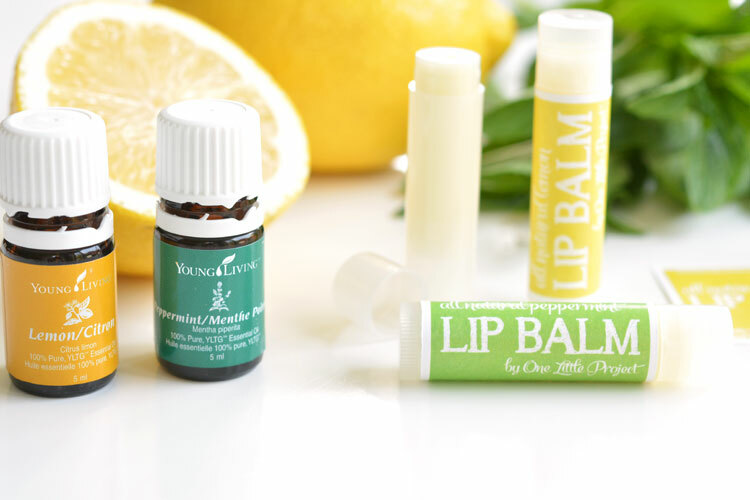 I used my Young Living Essential oils and they ended up smelling wonderful! 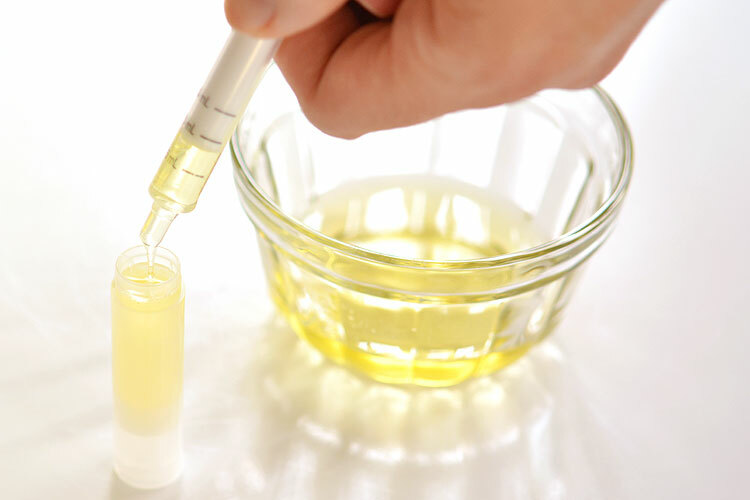 To find out more about getting started with essential oils, check out this post. 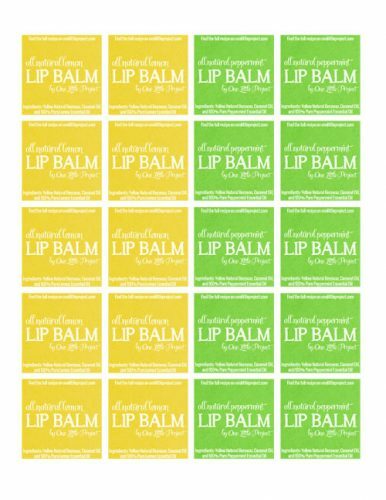 You can double or triple this recipe if you want, but I didn’t want to be left with dozens of lip balms, so I made a small amount. It was enough for 5 tubes of each flavour, so 10 tubes total. I probably could have gotten 6 tubes from each recipe but I spilled a bit. Oops. 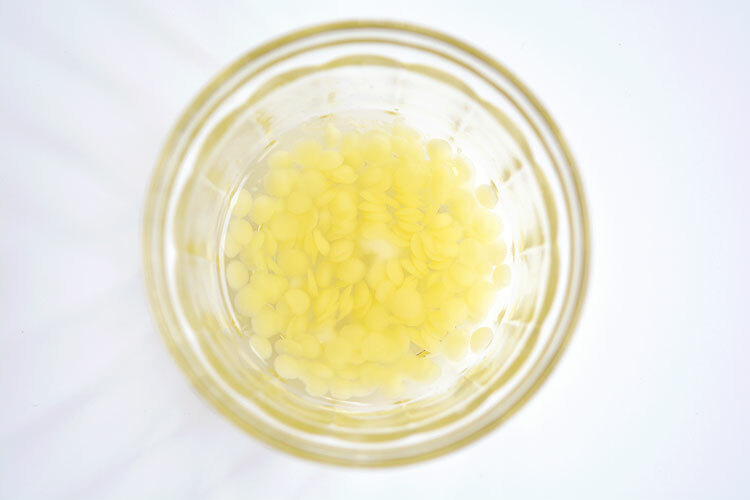 Add 1 Tablespoon of the beeswax pellets into a small glass dish. 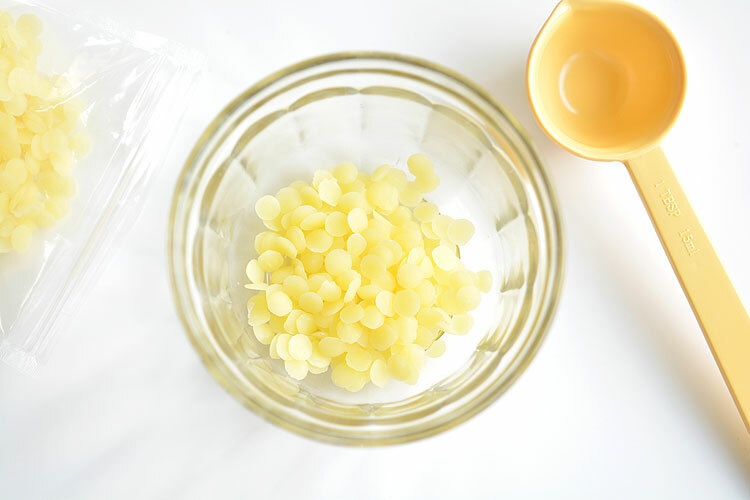 You can buy solid beeswax (as long as it’s cosmetic grade) if you want, but then you have to figure out how to grate it and melt it down, so the pellets seem so much easier. Microwave the pellets on high power for about 45 seconds. If you have a strong microwave, start with 30 seconds before checking on it. Then add 1 Tablespoon of the coconut oil. This stuff is a little more refined than what you’d buy in the grocery store. Mine didn’t even have a smell to it. Return it to the microwave for another 45 seconds or so. See how everything started to melt down? I microwaved it for 45 seconds one last time and it was completely melted. So three times 45 seconds on high power was all it took for me and my microwave. 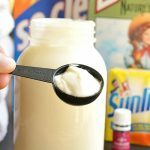 Next add in the essential oils and mix it well with a small fork or baby spoon. You might want to return it to the microwave after this for another 15 seconds, just to keep it warm and liquid. I used a leftover sterilized syringe from one of my baby Advil boxes to fill the little tubes. There’s no way I’m steady enough to pour into such a small opening freehanded. The syringe worked really well. It cools and solidifies fairly quickly, so if you notice it clumping up as you fill the tubes, put the glass bowl back in the microwave for 15 seconds to heat it up again. Fill the tubes as full as you can without overflowing. By the time I finished filling the 5 containers, the first one had already solidified. I love that there was no waiting required. I mean, you might want to give them 5 minutes to harden, just in case, but I was too excited, and tested one out right away. They looked awesome when they were done! And they smelled amazing! This lip balm is PERFECT. It’s silky smooth and moisturizes the lips really well. I can’t believe it’s only three ingredients! So easy! I used 3 drops of the Peppermint Essential Oil and I’d recommend 5 drops of the Lemon Essential Oil. I only used 4 drops of the lemon, and it’s not quite strong enough. 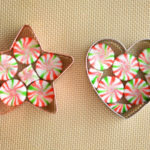 I was worried the peppermint would be overpowering, but it’s perfect. The smells are seriously wonderful! 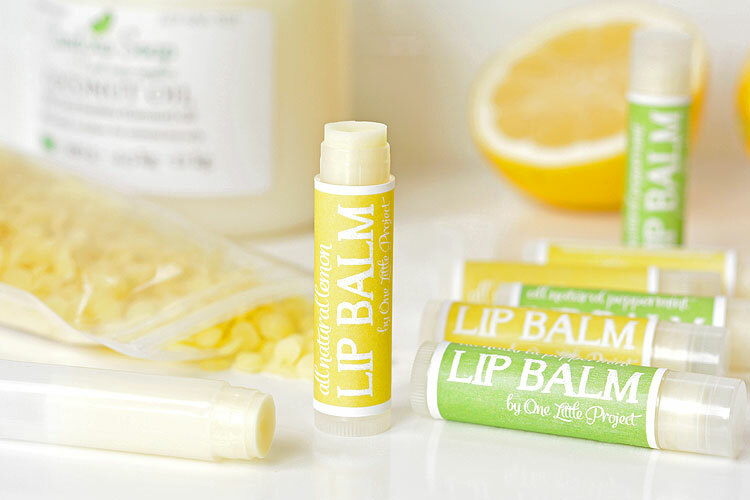 They really make the lip balms feel luxurious! These would make awesome gifts! Imagine how cute they’d look in a small cellophane bag with a fancy ribbon? Perfect for Mother’s Day, Christmas or when you need a small hostess gift. My mom already asked me to save one for her. 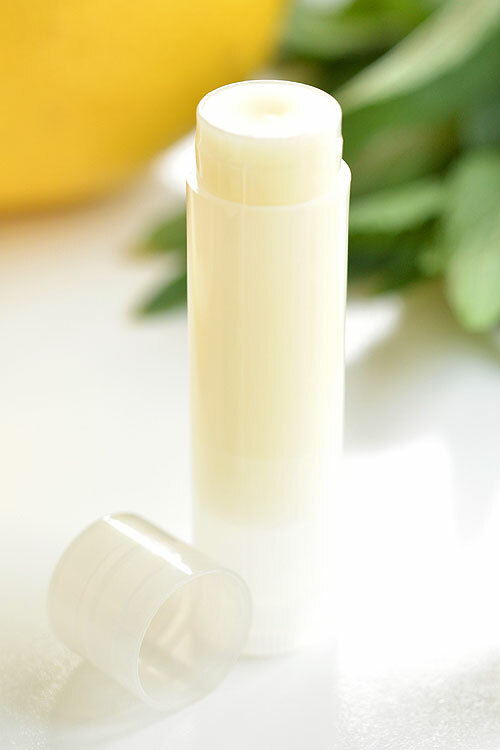 This recipe only takes 5 minutes and makes enough for 5 or 6 lip balm tubes. You can easily double or triple the recipe. Wash your hands and all of your equipment thoroughly. 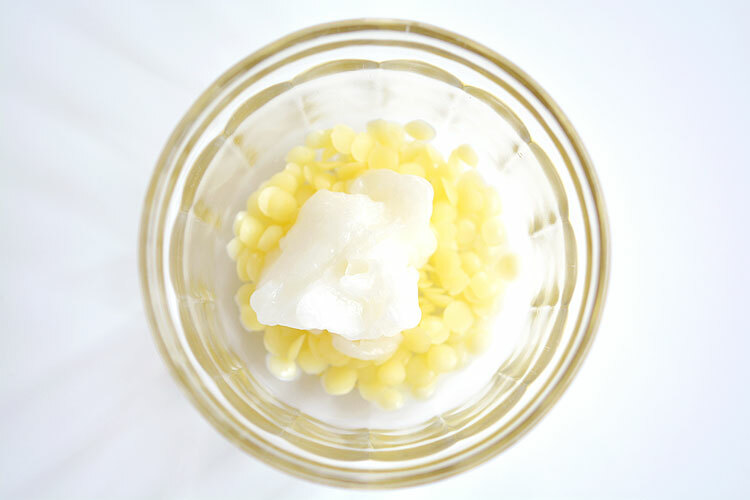 Place the beeswax pellets in a small glass bowl and microwave on high power for 45 seconds. Add the coconut oil to the bowl, and return to the microwave for another 45 seconds. Continue to microwave in 30 second increments until everything is completely melted. 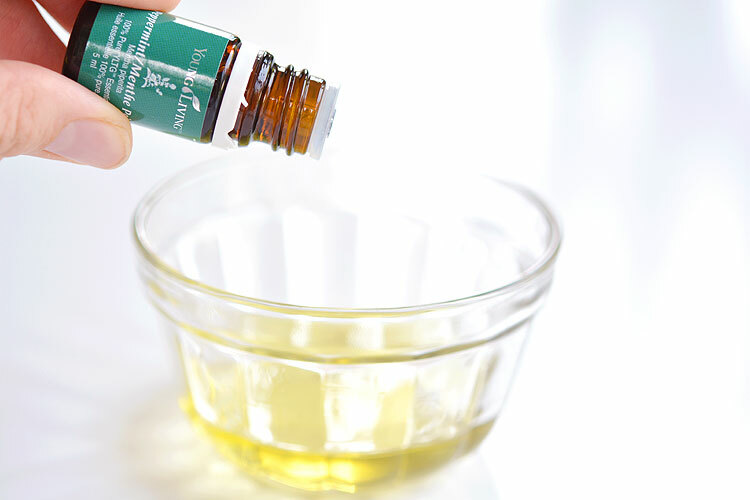 Add the essential oils and return to the microwave for another 15 seconds. Using a syringe, fill each lip balm container as full as you can without overflowing. If it starts to harden before you're finished filling the tubes, return the glass bowl to the microwave for 15 seconds to keep it melted. 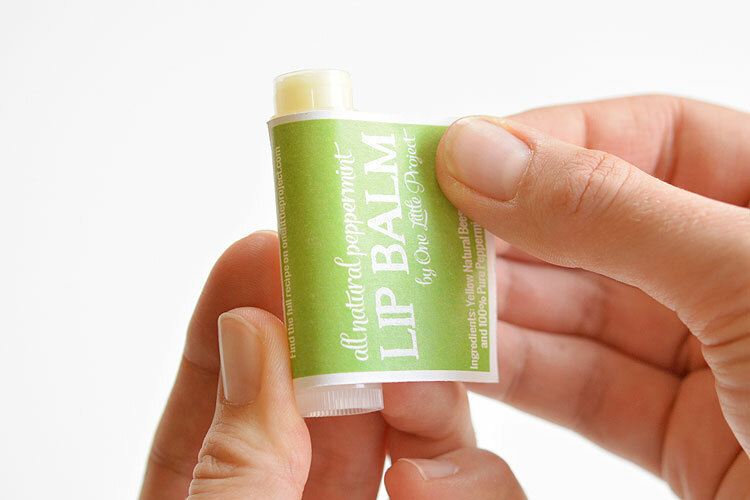 Once it solidifies (about 5 minutes) add your lip balm labels to the tubes and enjoy! Wasn’t that simple?! 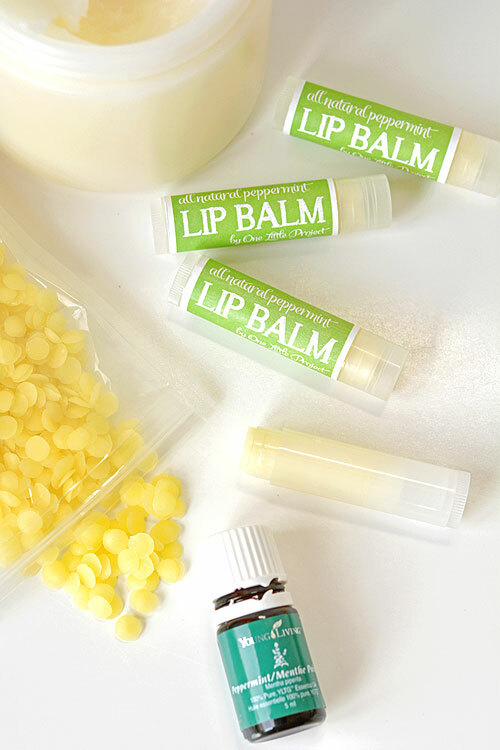 This homemade lip balm is SO EASY to make. It only takes 5 minutes and just three simple ingredients. It solidifies almost instantly, so you don’t even have to wait for it! It smells amazing and has a wonderful silky smooth texture to it. It’s perfect for those of us with sensitive skin! 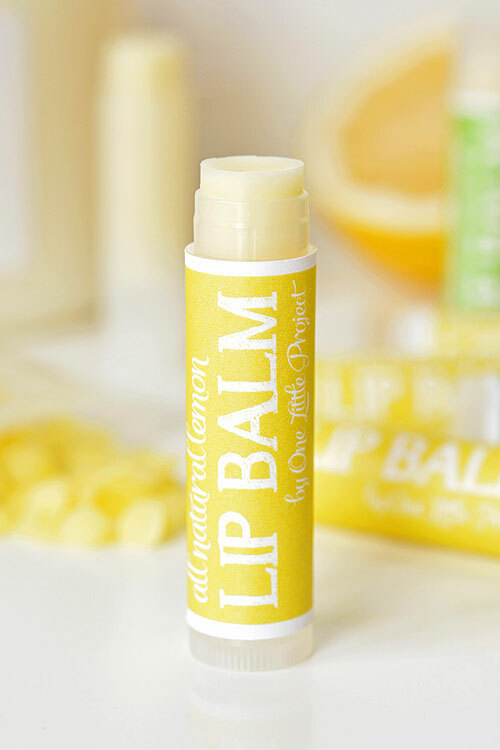 We always love a good lip balm. Not too far from the ocean it gets windy every afternoon! I love the idea of using a syringe to fill the tubes. Seriously makes it so much easier. Thanks for sharing at the Inspiration Spotlight party. Shared! What’s the expiration on this? I love the simplicity of this recipe but I have a question, can you replace the coconut oil with murumuru butter instead? And can you add food colouring to it to create more of a coloured lip balm? I also have very sensitive skin and alot of allergies as do my children. I am so excited to try this! With that said, can I use olive oil instead of coconut oil? 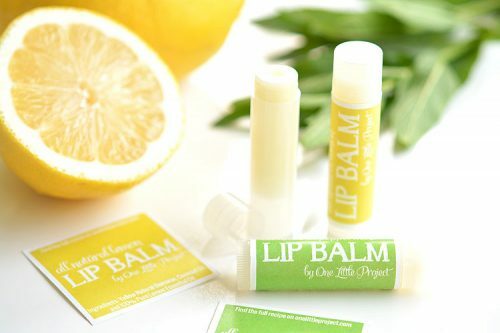 Love the lip balm, so easy! I also love your labels but wanted to use other oils. Do you have a printable that can be modified? Thanks so much! Love this idea! I’ll take your recipe for my blog of gift handmade! Is there an option for people who do not have a microwave? ( yes there are some of us) I feel your pain with the lip irritation-anything with menthol is evil! Careful when using thin glass in the microwave – mine exploded after I removed from the microwave and poured into my tubes. I assume it was the sudden temperature change. Great simple recipe though. I used lilac essential oil in mine. 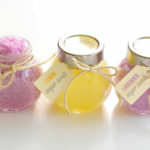 I’m working on a spa party for my daughter. 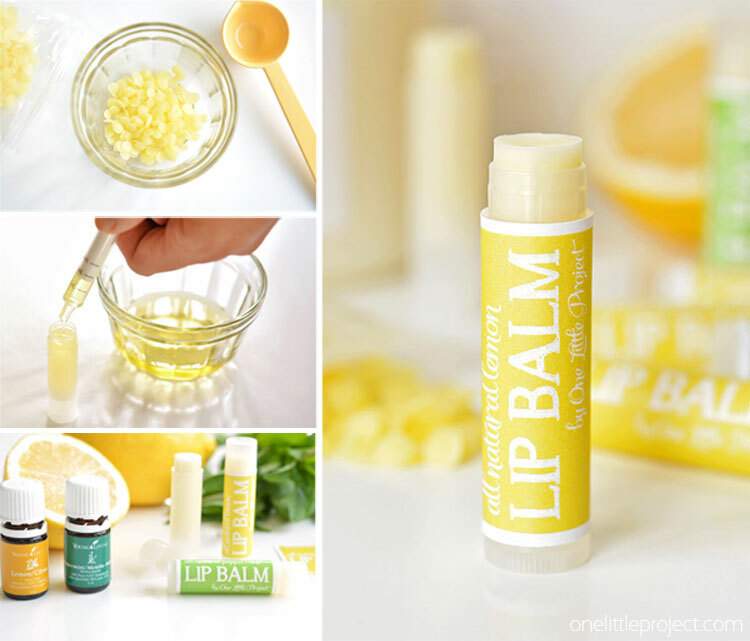 So I can plan accordingly with ordering my ingredients, how many chapstick style containers does the recipe (1 tbsp beeswax to 1 tbsp of coconut oil) fill? 1) What type of essential oil do u recommend? safe to consume? 2) how long can I keep it before expiry? I love the simplicity of this recipe, but it only makes two and one-half tubes not five. Very cute labels. Do you know if this lasts well during the summer (times of high heat)? Thanks for sharing your Recipe.its delicious. Just have a question about the label. Are they individual label? I been looking for label.but i got one it did cover the lipbalm.